Only registered users can read this post. 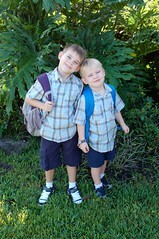 Alex and Nate both had their first day of school today. Alex started second grade, and is a proud new member of the Starfish Pod. Nate started VPK, the state’s voluntary pre-k program. On Saturday, we went shopping for school clothes, and I had quite a lot of convincing to do to get the boys to understand that they would be wearing these button-down shirts as their first day of school outfits. They have no problem matching each other, but they don’t like button shirts! They were bribed, in part, with the fact that they finally got to wear their new sneakers. This year’s new sneakers are very special — Alex got himself hooked up with glow in the dark laces, and Nate’s are firefighter-themed and have blinking lights. Last night, as we were cuddling and getting ready for bed, I was explaining to Nate how his first day of VPK was very cool but that he had no reason to worry because he was going to the same class where he spent the summer, and would have the same teacher, and he got to be a leader in his class for some of the new kids who may not be used to going to school. I thought this would make him proud and help him step up to the plate, so I was a bit surprised when he burst into tears when I said it. The reason? “I may not know their naammmmes!” Poor dear. I told him he would learn their names, and it would be fine. This morning, I made cinnamon buns for breakfast as a celebration of our first day. Not, perhaps, the healthiest breakfast, but on Saturday as we were leaving Ikea on Alex went nuts over the smell of the cinnamon buns, and we didn’t get any then, but I tried to make up for it today. Drop off went surprisingly well for both boys. I dropped Nate off first, as he has the bigger time constraint now that his school starts earlier. He marched right into his class with just a blown kiss from me, to the great chagrin of some of the other parents who were stressed to the max about leaving their babies for the first time. The staff and Alex’s before school program were suitably impressed with the fact that I got him into a button shirt and shorts. Mr. Patrick remarked “my goodness, he has legs under there!” Alex insists on wearing sweatpants about 95% of the time, so the fact that I got him to wear shorts to school was a minor miracle. Nate informed me that he didn’t get to use his new scissors and glue today, but otherwise, he had a good nap and a lovely day. Alex exclaimed that he had a GREAT day and could not wait to go back and have a great day every day. Here’s hoping that this trend continues for them both! Alex crossed over from Tigers to Wolves today. They had a lovely ceremony at which the boys walked over the bridge our pack made, and were presented with the new neckerchiefs for their new rank. So proud that we’ve all made it through the year intact! 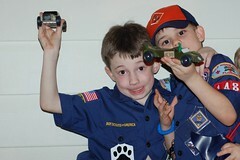 Alex competed in his very first Pinewood Derby last night. He worked really hard on his army-themed car. We tried to manage expectations, and warned him not to expect to win. He didn’t win — didn’t even make it to the second round — but he was so very gracious about the whole thing. He stoically said “I didn’t win, but that’s OK, because I did my best, right Mom?” I was bursting with pride. He cheered very hard for his friends, and his Den-mate and classmate Kenny managed to take the top prize for Tiger Cubs. Here’s Alex and Kenny showing off their cars together. Alex is bubbling full of ideas for next year’s Pinewood Derby. I am looking forward to seeing what he comes up with! Uncle Ray on First Day of School!